Welcome to our January Stamp of the Month Blog Hop! We are starting a new year of blog hops for you all featuring Close to My Heart's Stamp of the Month. 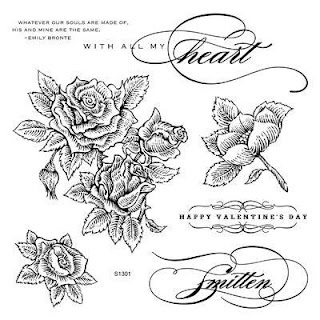 This set is just so pretty and has 4 different sentiments included! In this hop, you will see projects featuring this beautiful stamp set from many talented crafty ladies! 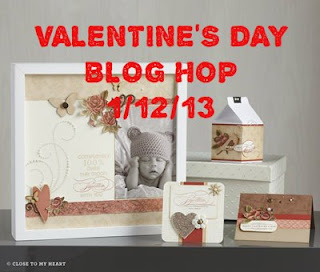 Enjoy our blog hop! If you came from Priscilla ~ Priscilla's Paperie then you are in the right place! For my project, I wanted to do something a little different with this stamp set than say, a card or a layout. I remembered some of my crafty friends had made boxes and put candy in them, and I thought perfect! I decided on the largest flower in the set to be my main image, and after that all I needed to do was decide on the box size. This box was cut from the Artiste cricut cartridge, page 49. To make the base, use 3D object and the letter o, and to make the lid, use shift 3D object and the letter O. The box is cut at 5 3/4 for both pieces. I stamped the flower stamp in my white daisy pigment ink. I stamped the Happy Valentine's day using smokey plum pigment ink, which can be found in the mini pigments pads set, enchantment. I then decided that my box could use a little bling, so I got out my sparkles flourishes. The sparkles were a little too big, so I cut them to the size I needed. I used seam binding ribbon for my bow. This box is large enough to hold 20 of the candies you see. I was not sure what size to cut it at, so I messaged my friend Bonnie Donaghy to see how big she made her boxes at Christmas. She cut hers at 4 inches and 8 candies will fit in the box. This box would also be great for notes, cards, or other small gifts. That colour combo is stunning. Great idea with the gift box. Love it! very dramatic with the black and white. Thank you all for the nice comments. I hope that my project inspired you to make something pretty! That is really neat! I love it, and the colours too! I just love this idea of the box, great for treats! The Everything ABC's blog hop letter "B"